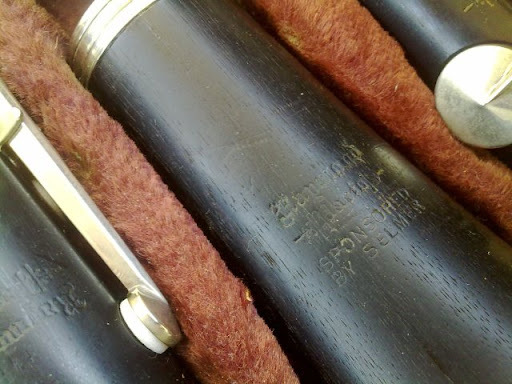 Since the clarinet says, “Sponsored by,” it was not made by Selmer, but by one of the stencil makers. I'm thinking this is a very late Couesnon because of the unified left pinkie keys and the three posts for the throat tone A and G#. Compare with Barbier Couesnon. There are no batch numbers under the keys. Judging by the fake crocodile skin case (which looks original), the unified left post, and high quality chrome plated keys, I would say the horn was produced around 1940. For this test I used a 65.7mm plastic no-name barrel. Intonation summary: If played with a shorter barrel, this horn has workable, but not great intonation. The worst problem WAS the throat-tone B-flat, but I have undercut the A and B-flat tone holes and improved those notes. This can be in tune if not played as loud as I do when testing. But if playing loud, one would have to learn how to use the side B-flat key. 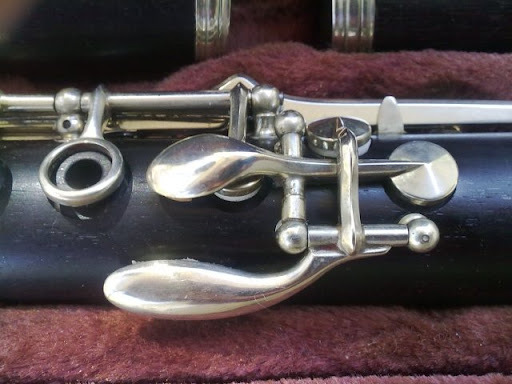 This clarinet has excellent chrome finished keys. No wear. Must not have been used much. There were two cracks in the bell, a small crack at the top of the RH joint, a hairline crack that didn't go into the interior in the LH joint, and a slight hairline in part of the bore of the barrel. All were fixed. 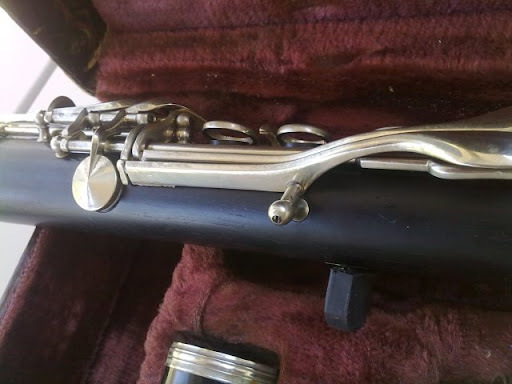 This clarinet is most appropriate for: This would work for a beginner. When it was made, it would have been an intermediate instrument.